IRVINE, CA--(Marketwired - Jan 14, 2015) - In the most coveted residential areas of Italy, piazzas offer charming communal spaces for gathering outside the home and bringing together neighbors as friends. The same is true of Brookfield Residential's La Vita at Orchard Hills™, where lifetime friendships are being forged among the spectacular surroundings of this exquisite new Irvine luxury neighborhood. Designed in the tradition of the finest Italian villas with authentic Tuscan elevations, Mediterranean ambiance, and inviting street scenes featuring piazzas and private driveways, La Vita at Orchard Hills™ promotes a community feel that fosters warm friendships among likeminded individuals who seek an upscale, high-style neighborhood in a desirable setting. Located behind the dramatic entry gates of the Groves in Orchard Hills, La Vita homeowners are experiencing a new level of prestige, with rapid sales reinforcing the desirability of this one-of-a-kind new home opportunity. "La Vita inspires a compelling reaction from those who tour the neighborhood for the first time, to those who have already moved in," said Mercedes Meserve, Vice President of Marketing for Brookfield Residential Southern California. "Even in the luxury home market, buyers are not accustomed to seeing a neighborhood that offers the architectural detailing, richness and friendliness that are all central within this environment. La Vita homeowners are finding that they have a lot in common and are building lifelong friendships beyond their shared love for the neighborhood. By offering classic Italian piazza surroundings, neighbors have found it easy to visit with each other, and it's been wonderful to watch these friendships unfold and see that community spirit is alive and well at La Vita." The award-winning* neighborhood of La Vita offers grand estate-style living with a new air of elegance. Exquisitely detailed exterior architecture is combined with innovative floorplans that have been designed to showcase the best of luxury living. For more information and to take advantage of the rare opportunity to own one of these exceptional new residences, visit La Vita and tour the four beautiful model homes, or log on to www.BrookfieldSoCal.com for immediate details. La Vita is adding to Brookfield Residential's legacy of luxury new home offerings. Known for its impeccable designs, high-end features and finishes, and top locations, the renowned homebuilder has surpassed expectations with this unmatched new neighborhood. Priced from the mid to high $1 millions, residences at La Vita range from approximately 3,400 to 4,000 square feet, with 4 to 5 bedroom suites, 4.5 to 5.5 baths and 2-car garages plus additional storage space. Home designs reveal light-filled spaces and sightlines that provide beautiful vignettes indoors and out. Gourmet kitchens with expansive islands and adjoining prep/high heat wok kitchens with walk-in pantries, sinks and second dishwashers are ideal for daily meal preparation and special occasions. Homeowners can also choose to turn this space into a craft room. First-floor master suites and/or generous guest suites in each of the four residences provide the ideal space for teenagers, college students or visiting relatives. One of the most coveted aspects of La Vita is the immediate access to the outside. Homeowners can move seamlessly from inside to out simply by pushing aside the bi-fold or multi-slide pocket panel doors to enjoy stunning views of Orchard Hills' natural surroundings. Orchard Hills™ is a village so unique, there will never be another opportunity like it in Orange County. A place of such dramatic topography and natural beauty, it is distinguished as a true landmark within the Villages of Irvine®. Set amidst rare natural beauty, 12 new home neighborhoods offer an impressive range of architectural designs within this extraordinary Irvine address. Rolling hillsides, acres of open space and proximity to working avocado groves highlight the village's rare natural splendor and serenity. Brand new luxury neighborhoods epitomize sophistication and architectural differentiation. Created by Irvine Company Community Development, Orchard Hills is conveniently located in Irvine, California. The City of Irvine was recently ranked by Money Magazine as the "6th Best Place to Live in America." The highly-acclaimed master-planned community is renowned for allowing residents to enjoy a unique lifestyle unmatched in the region -- some of the best schools in the state; America's safest city for nine straight years; abundant open space, parks and recreational opportunities; and world-class dining, entertainment and employment. 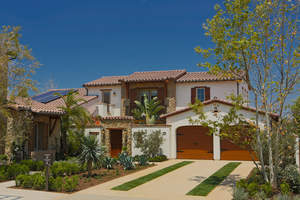 For more information about the Villages of Irvine, visit www.VillagesofIrvine.com. *Community of the Year award at the prestigious 2014 SoCal Awards. To visit La Vita from I-5, exit Culver Dr. and head east. Cross over Portola Pkwy, make a left on Settlers and proceed through the Groves entry gate. Turn left on Fiddlebow, then left again on Sunset Cove. The guest parking lot is located on your right hand side, past the model homes. The La Vita Sales Office and Model Homes are open daily from 10 a.m. to 5 p.m. and 2 p.m. to 5 p.m. on Wednesdays. For more information, please call 888.331.5915 or visit www.BrookfieldSoCal.com. La Vita showcases inviting street scenes featuring piazzas and private driveways.